Last week, the gloves came off. As if to give credence to the rumour that he’s left the APC for PDP, Atiku revealed that Buhari was not allowed into the US for a good number of years on account of his extreme religious views. 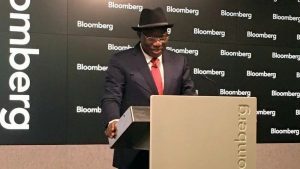 GEJ, the former President of Nigeria, was put off by Governor Shettima blaming him for Boko Haram’s devastation of Borno state, so he exposed the Governor’s role in the capture of the Chibok girls. The Senior Special Assistant to the President on Foreign Affairs and Diaspora has refused to embark on the guilt trip Nigerians are hellbent on sending her to, for standing by while our citizens were auctioned as slaves in Libya, after all, she warned them. “Tricycles and motorcycles are important in the area of provision of essential and easy to reach transportation all over the country. Finally, someone speaks up in defence of the masses. Just in case you haven’t stacked those millions and you’re thinking of a career in politics, think again. Can someone please give the good Senator a medal for bravery? That’s the Minister of Finance last word on the matter. Wow! A rare display of leadership from the Permanent Secretary, Ministry of Interior, Abubakar Magaji. Gotta say, we thought this merry go round over Maina’s reinstatement will last through Christmas. We didn’t expect someone to cave in so soon. Who angered GEJ like this, that he vomited this sort of vitriol? And to think this is just the tip of the iceberg. It appears Governor Shettima did not choose his opponent well. Strange words for a Nigerian politician to utter. Is Governor Shettima being bogged down by guilt, perhaps? Did GEJ’s arrows strike true? That’s a portion of Saraki’s tale, explaining the sort of complacency and unintelligence Jonathan brought with him to power. “This fictive concoction being passed off as truth is mind-boggling, coming from a former Number Two man of Nigeria, who should know the truth. “At no time was President Buhari, as a private person, ever forbidden from entering any country in the world. Someone said nothing is true until they start denying it.